Forklift License Guide: Essentials for Individual and Employer - Be Certified Today! Congratulations on your decision to pursue a career as forklift operator. The very first step to begin is to get a forklift license. Synonymously, license is referred to many terms such as forklift certification, training or operator card. Being licensed makes you ripe to be picked by big businesses, it brings various opportunities for your future career. With career path progression, you could become a team leader, and with the necessary training, you could be promoted as forklift training instructor. Driving forklift is a kind of job that will continue to be in high demand in many countries like the United States, Australia, Canada and the United Kingdom, among other else are the Middle Eastern counties. We've made available the necessary information that you need to make forklift license application as easy and convenient as possible. Application of forklift license varies from country to country, for this reason, we've prepared accurate, current and relevant details about the process where you want to take your forklift training course. We’ve prepared lists of training schools, providers and centers of each state or territory where you can take your training course. This is very helpful as you do not have to dig for information online, ask in forum or your colleagues. We’ve readied step-by-step and easy to follow detailed instructions on how to apply for the forklift license and training. We have useful bog section where readers can study about writing resume, learn about forklift operator job responsibilities, and many diverse subject matters that will be useful. We’ve made available for all trainees PDF documents as guides to help them ace the forklift certification. If you’re located in Australia and you want to know how to obtain your forklift license, you can browse Australia link above. We have lots of tutorials, tips and advices to help you started; tutorials are specific to your state or territory. If you are intending to get a license in the United States, browse at the U.S section. We can provide you facts, just locate your state where you are located, and read the tutorials. For Canada and UK, we have special sections that tackle about forklift certification in these countries. Click the link at the above menu, and learn more about licensing in your countries. The training course must be in accordance with OSHA standard, training schools must meet the standard or exceed it. The training course is compulsory for all individuals to take as you cannot be certified without going through it. The training course should be facilitated by an accredited trainer. Accredited means that the trainer himself must be OSHA certified who took and completed the Trainer-the-Trainer program. The trainer must also be experienced in this field, who gained years of experience driving different types of forklifts and training others. The course is composed of three parts: the formal classroom lectures, the hands-on forklift operation and test and evaluation. This is the standards based on OSHA legislation. Certificate of training and forklift license will be issued after course completion. The license has three years validity. Trainees must not be in legal age of 18 years old. This is the age requirement of the employer as well. You must be at the right age. The minimum educational background of a trainee is high school graduate or those who attained GED certification. Businesses may require operators to work for long hours during production full swing, a trainee must be in very excellent physical condition and able-bodied to finish job assignment. Constant communication at work is key to get the job done that necessitate trainees to speak, write, and communicate in the English language. Other documentation may be necessary as demanded. If Your Question is Where to Get Forklift Certification Near Me? If you are asking the question where you can get forklift certification near your location, then, look no further. You don’t have to look anywhere else, we have that prepared for you. In this blog, we have provided you and listed down the directory of forklift training schools where you can get your forklift training from. Aside from that, we also have answers to your most frequently-asked questions about training and certification. In our blog resources, we have covered everything for you so that you won’t be having a hard time looking for information. Our easy guides and tutorials offer you the convenience of learning online so that you won’t get astray. Guides include easy step-by-step process in taking forklift training, list of training providers in every state or territory where you can get forklift license from, passing the forklift written and practical tests so that you won’t have to take it several times thus saving you time and money, getting a job as forklift operator if you succeeded taking your forklift license, how much can you make as forklift operator in your area or location (we made this updated as frequent as possible), and many more just browse your blog section. What we have at this website is perfect for novice drivers who are trying to find a new and rewarding job and expert individuals who want to advance further their career and market prospect. Whatever your skill level, we have the stuff you are looking for. How Forklift Certification Can Benefit You? In the countries like the United States, United Kingdom, Canada, Australia, and New Zealand, laws and regulations have been enforced to set standards of training and licensing in order to protect workers from industrial accident. Commonly, such standard prohibits individual from driving heavy equipment like forklift without having a license or certification; operator must have forklift certification before he is allowed to drive forklift at work. Forklift certification helps employers to make sure they are in compliance with the prevailing government regulation. Different countries have agencies that keeps an eye on safety. 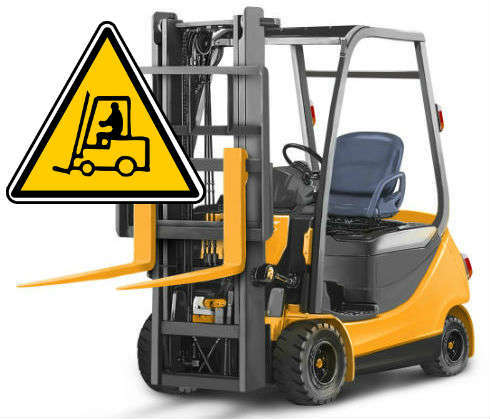 As an example, in the US, OSHA has set forth 29 CFR 1910.178, stipulating the standards to follow in forklift training. Since companies look for those individuals who are already trained, having forklift certification can easily land you a high paying job. Since forklift operator will be in demand in the years to come, you can expect long rewarding career in this field as well. By supplying forklift training to workers, companies can assure of conformity with the government regulation. This will help them get better grade in the safety inspection. Good ranking could help minimize insurance premiums. For companies with certified forklift operators tend to boost their productivity, and result in fewer accidents (damage to property, near miss, etc). Trained individuals paid more than those who are not certified. Well, that’s a reality. HR managers prefer those applicants who were already trained. The company no longer has to send the workers to training school that may dictate additional cost for the company. Boost in morale. Workers who are trained by the company feel they are cared for by the employer. In return, workers tend to work hard and more productive. Instilling the spirit of safety. Forklift training just like any other education, can instill learning to workers’ minds. In this field where accident lurks in every corners of the workplace, safety is number priority. With professional forklift training, safety can be infused to the minds of the forklift operators. Forklift training takes only few days to complete and could only cost you small sum of money, but the advantage is huge! The schools are synonymously called training centers or providers, or in Australia they’re called registered training organizations (RTOs). Whatever their name might be, the role of the school is to give comprehensive training programs that follow the regulation and standard. The schools have their own facilities to conduct the training at, and they also have their own in-house OSHA certified trainers. The employer, seeking certification, can arrange such training tailored to their need. The training could also be done at employer's worksite and specific with the fleet. What is Your Future as Licensed Forklift Operator? There will be no shortage of job opportunities for skilled worker like you. There are huge market due to the boom in construction industry, logistics and warehousing companies, ports and shipping lines and manufacturing companies. There should always be skilled operators like you to do the loading and moving of goods in and out of the business. Look at the graph below from Indeed, from the year 2006 to present there’s a huge spike in these employment opportunities. Though, from 2009 – 2010, the market is heavily affected by the global crisis, it continues to rise after those years. According to the report issued by US Bureau of Labor Statistics (BLS), forklift driving job will continue to rise until the year 2020. 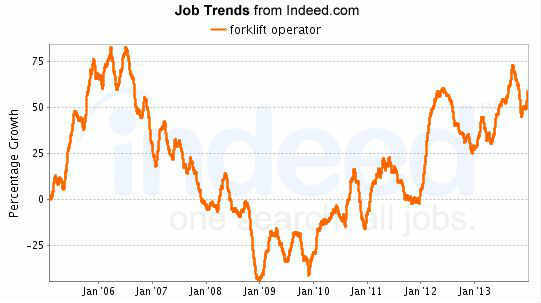 Forklift operators salary will average $31,000 per year. The training must be regulated according to standards and the employers and operators must follow it, otherwise, they could be penalized. The penalty is severe and harsh. OSHA requires all employers to train and certify their forklift operators. Inspector can conduct surprise visits making sure that legislation is being adhered to and implemented by big businesses. Accident can happen anytime, and if operators were found to be unlicensed, they could face fines and criminal charges. OSHA is serious about it! We wish you good luck on your chosen career path. We hope your gather sufficient information from us so you can easily obtain your much required forklift license. Forklift training is designed to give an edge to forklift operators to be away from harm’s way while at work. The training is crucial is maintaining the workplace safe. A well trained forklift operator is the key to make the business progress and succeed. The employer plays a very vital role in achieving a hazard-free workplace.